2005 INITIAL STATEMENT BY JEFF MORRIS: "The environment onto which I eventually plant the seedlings is Piedmont woodland, mostly hardwoods. It is a zone 7 climate, and the forest is semi-wild, having last been cut over in the 50s. Situated on a bluff overlooking the South Yadkin River, there are perhaps two areas I would consider microclimates, which might support zone 8 plantings. Shading would be from Spring through late October, as the forest is primary deciduous. Soil is low pH, mostly sandy clay, so I'll be liming the trees twice per year, to maximize protection from the blight that has decimated the native stands. The contour of the land is rolling hills and bluffs, so pretty much anywhere I choose will be well-drained. Knowing that T. taxifolia prefers mostly shade, I doubt that I would attempt to plant any of them in clearings." Of the ten Torreya taxifolia seeds [from the Biltmore Estate] harvested in the fall 2005, I had 4 come up  all in 2007. I also bought 5 from a nursery in Georgia that year, out of which 3 have survived and thrived. I've not planted any in the "wild" as of yet. But I thought I would share with you something that might be of value. I have observed that the root structure of T. taxifolia is slow growing to the point that it would be very difficult for containerized seedlings to become root-bound. But once my 3 gallon container seedlings have a healthy root system, I began using gibberellic acid a/ka/a "GA3" (500 ppm max) as a foliant spray, on half my stock since 2009. The theory from other conifer enthusiasts was that this would assist in growth and maybe cause premature seed propagation. (Thus, it was essential for the root system to be very well-developed, since I would be asking it to pull alot more duty with the upper portion of the seedlings!) For the most part, the GA3 treated seedlings grew more foliage, and the girth and maturity of the 'trunk' is slightly greater. But this morning, I discovered that on one of the purchased seedlings, I have 6 plums. And on one of the seed-grown seedlings, I have a single plum. That's on a 4th year seedling, which thrilled me. I misted GA3 on all remaining seedlings, which I intend to do on a weekly basis all this summer. 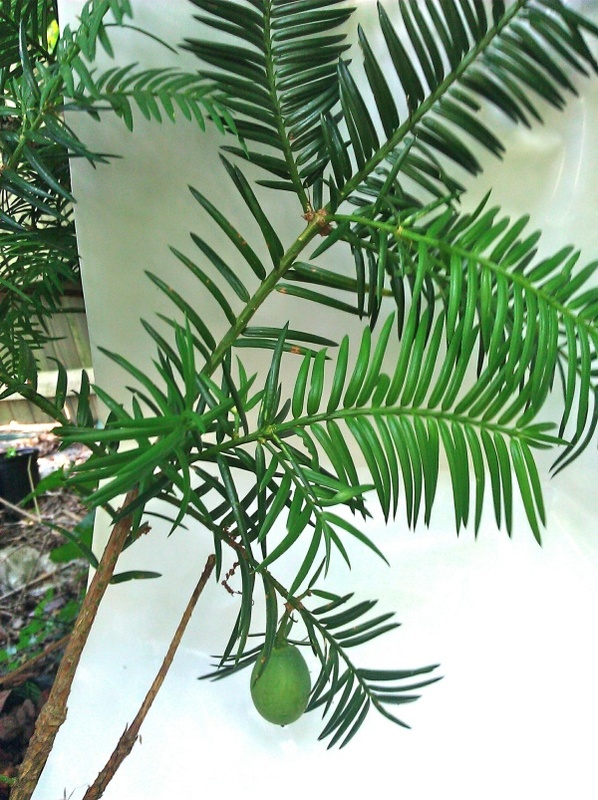 TAXUS FLORIDANA: I also had a purchased Taxus Floridiana sapling [FLORIDA YEW, also endangered from the same locale in northern Florida] that survived (the other one didn't make it), and it produced 7 seeded arils in 2009. 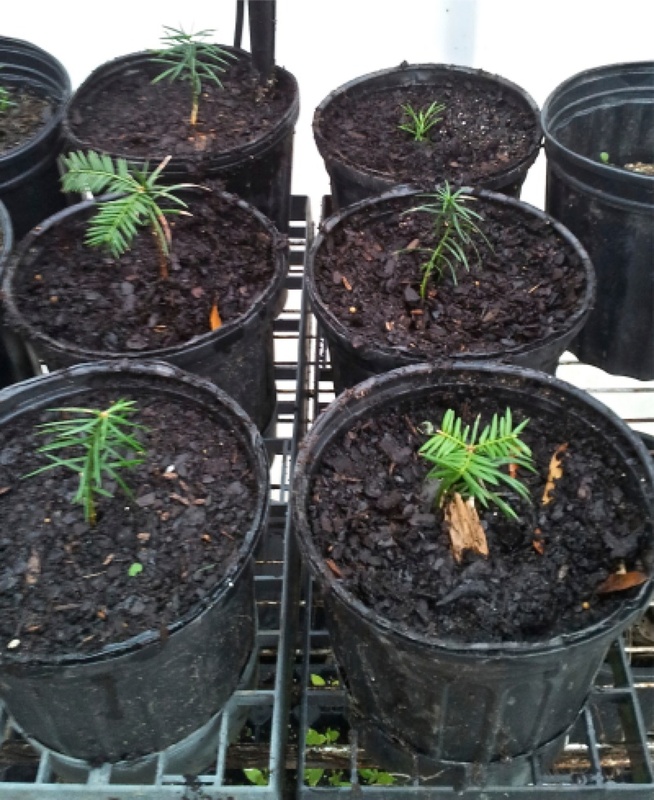 After GA3 centrifugation and cold stratification for a year, I planted the yew seeds in a raised bed last fall. So far, 4 of them have germinated  possibly a 5th, but it is along a border with Prumnopitys andinus, making it difficult to distinguish. 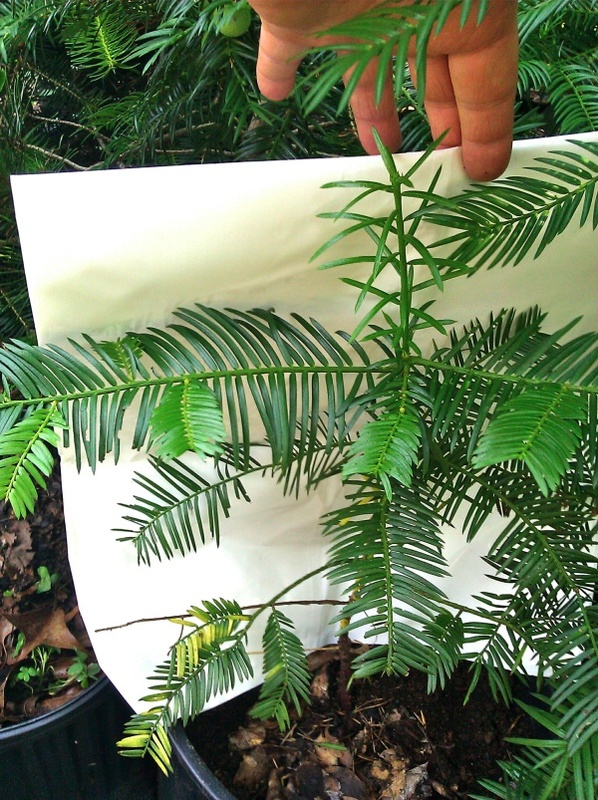 I had not used GA3 on the purchased Taxus Floridiana, but I intend to do so the rest of this summer on a weekly basis, to see if it causes more prolific (and frequent) seed production on that plant, also. I am attaching some photos. I will be making wire cages this afternoon, to place over all plums until they fully ripen and drop in late summer. 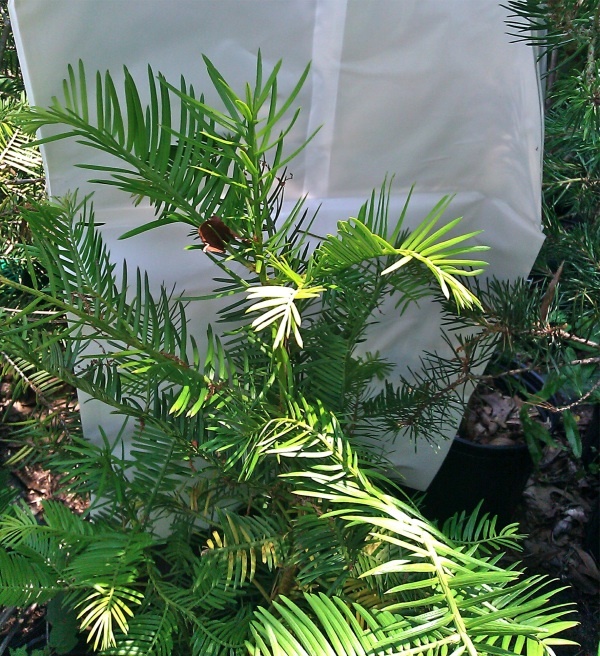 I also intend to use a GA3 centrifugation process for 24 hours prior to placing them in raised beds for the winter, which helps break internal dormancy in somewhat similar taxus, podocarpus, and prumnopitys species. As you might guess, I've set up an amateur laboratory for this purpose. P.S. The Torreya taxifolias really appreciate LOTS of SHADE in my limited experience. I have 7 seeds I'm about to harvest. I've built a germination box to place in the ground, with 1/4" rabbit wire to keep out rodents and squirrels. So far, my seedlings fit the containers, but probably in the Spring, it will be time to set at least three of them out. It's my intention to strike some cuttings from established females in January, and to graft some male branches onto female seedlings, to allow for more efficient seed production. The environment onto which I would eventually plant the seedlings is "Piedmont woodland" mostly hardwoods. It is a zone 7 climate, and the forest is semi-wild, having last been cut over in the 50's. Situated on a bluff overlooking the South Yadkin River, there are perhaps two areas I would consider microclimates, which might support zone 8 plantings. Shading would be from Spring through late October, as the forest is primary deciduous. Soil is low pH, mostly sandy clay, so I'll be liming the trees twice per year, to maximize protection from the blight that has decimated the native stands. The contour of the land is rolling hills and bluffs, so pretty much anywhere I choose will be well-drained. Knowing that T. taxifolia prefers mostly shade, I doubt that I would attempt to plant any of them in clearings. I mainly want to go with what is tried and true, as opposed to experimentation, as my goal is to establish a seed source for this beautiful rare conifer. Of the 4 seedlings that came from seeds, one female (out of what I believe to be 3 females) bore a single fruit, and based on your observations, I now believe that it was one of the purchased seedlings from Georgia that bore 6 fruits. I believe both other purchased seedlings are likely males. So the seedling that bore a single fruit is from the 2005 stock, and I'd guess the purchased seedlings were rooted in about 2003. I also have a Taxus floridiana that bore 5 seeds a couple years ago, and while it looks healthy, has not produced since then. The four seeds that germinated from the 2005 Biltmore harvest did so in 2007. One produced its first seed (while still in a pot) in 2011; it had been treated with GA3. Received 40 seeds from 2011 seed distribution by Torreya Guardians. Note of November 2013: The first of the 2011 seeds began sprouting in the spring of 2013; more have continued to sprout thereafter. Report filed by Connie Barlow: On November 3, I met Torreya Guardian Jeff Morris for the first time. We met in a parking lot along I-40 north of Spencer. There we exchanged seeds/seedlings in order to promote genetic diversity within the orchards and plantings managed by Torreya Guardians. Jeff gave me 4 of the potted seedlings he germinated from 40 seeds from the 2011 seed harvest sent to him by Torreya Guardians. (These I immediately gave to our new Torreya Guardian volunteer, Jim Thomson, who planted them on his mountain-slope property in Cullowhee. Click for photos of the Cullowhee planting of these 4 seedlings. Jeff also gave me 28 seeds he harvested green around October 2 (early harvest to protect them from squirrels). These came from his own "trees" which are quite small, but which he specially treats in order to coax early cone production. 26 of these I sent to Jack Johnston to increase his access to genetic diversity. In exchange, I gave Jeff all 6 seedlings I had just collected from the Clinton NC tree, along with 12 of the 102 seeds I had also collected from that tree. I also gave him 12 of the 41 seeds I had gathered from A.J. Bullard's Mt. Olive NC tree (all of which can be seen in the photoessay, Clinton and Mt. Olive NC 2013 Seed Collecting). I also gave Jeff 21 seeds from the primary harvest of Torreya Guardians in 2013. 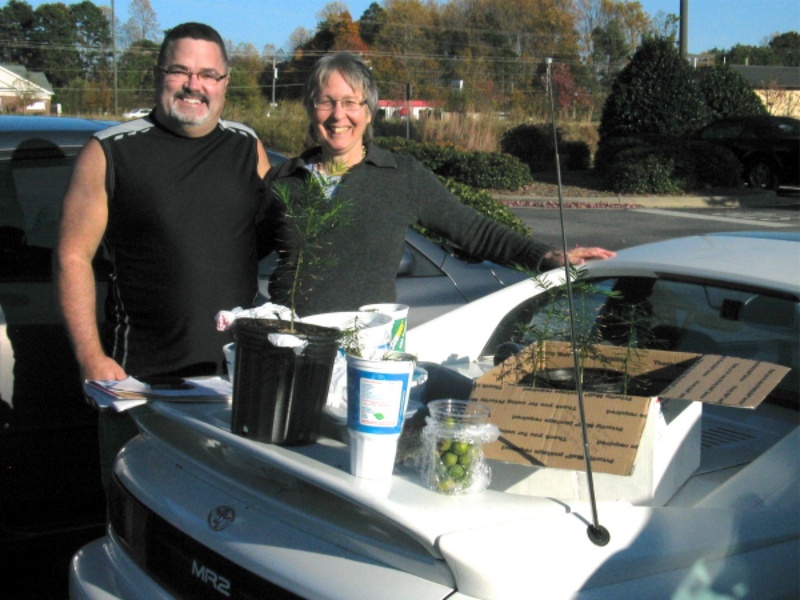 Photos below of Jeff Morris and Connie Barlow exchanging genetic diversity in November 2013, and the 6 seedlings from the Clinton tree, which Jeff transplanted into these pots and put into his greenhouse in Spencer NC. 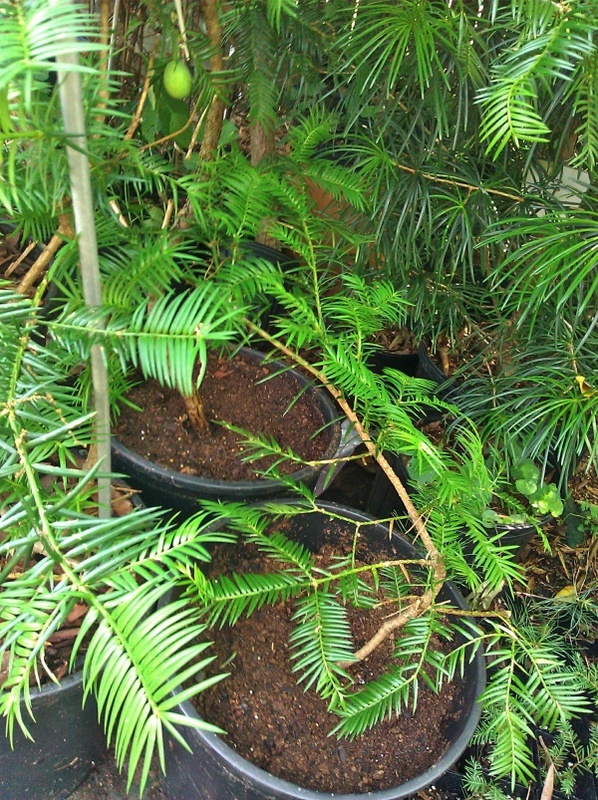 "When I was transplanting the six seedlings that Connie gave me in November 2013 [dug up from beneath the parent tree in Clinton NC], I made an observation of the Torreya taxifolia that I had not paid attention to before: mycorrhizal root nodules, similar to those I have seen on Cephalotaxus and Podocarpus seedlings in the past. Mycorrhizal root nodules work to facilitate a plant-fungal symbiotic interaction that is vital to the health of the tree. It could also be useful in assisted migration of T. taxifolia, as we seek answers to the 'ideal' place to plant the seedlings." For more information, visit the section on symbiotic fungi we have since posted on the propagation page. 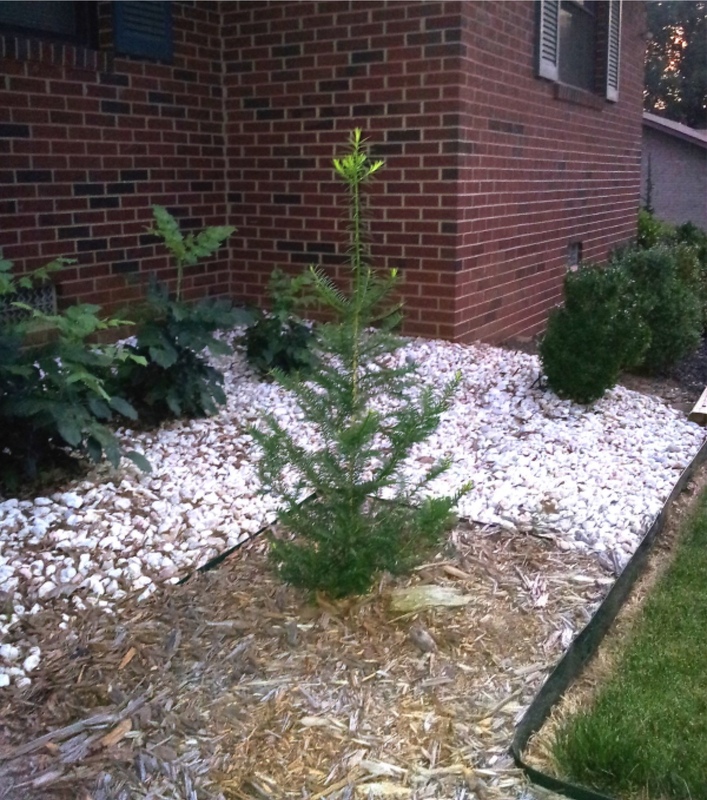 PHOTO LEFT: June 12, 2016 email: "This is a photo (of a 3-year-old Torreya sapling) I took yesterday that appears to be very happy in its second season in the ground at my home in Spencer, NC. It is 42 inches in height now. I'm thinking the presence of a taproot contributes to faster growth, as I planted it at only 5 inches in height. June 2, 2017 email: "The 2015 seed crop I was given [80 seeds] has yielded 50 germinated seedlings. I'm filling my little greenhouse with them. Amazing!"